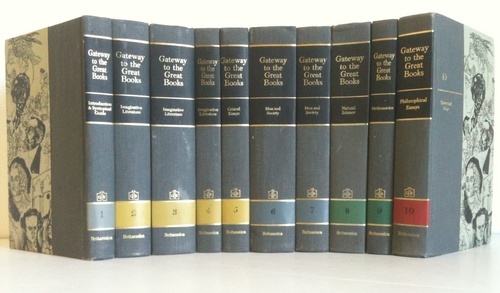 Gateway to the Great Books is a 10-volume series of books originally published by Encyclopedia Britannica Inc. in 1963 and edited by Mortimer Adler and Robert Maynard Hutchins. The set was designed as an introduction to the Great Books of the Western World, published by the same organization and editors in 1952. The set included selections - short stories, plays, essays, letters, and extracts from longer works - by more than one hundred authors. The selections were generally shorter and in some ways simpler than the full-length books included in the Great Books. A number of authors in the Great Books set - such as Plutarch, Epictetus, Tacitus, Dante, Herman Melville, Fyodor Dostoevsky, Jean Jacques Rousseau, David Hume, John Stuart Mill, Francis Bacon, Charles Darwin and William James-were also represented by shorter works in the Gateway volumes. And several Gateway readings discussed authors in the Great Books series. For instance, a selection from Henry Adams' Mont-Saint-Michel and Chartres critiqued the philosophy of St. Thomas Aquinas. Indeed, many writers in the Gateway set were eventually "promoted" to the second edition (1990) of the Great Books, such as Alexis de Toqueville, Molière, Henry James, Charles Dickens, Virginia Woolf, Albert Einstein and John Dewey. The set included an index similar to the Great Books' Syntopicon, along with reading plans of increasing difficulty. Hutchins contributed an introduction that was essentially a boiled-down version of The Great Conversation, his preface to the Great Books. The set contained biographical notes on the various authors, similar to those in the Great Books. However, the set also contained editorial introductions to the selections, which were generally not included in the Great Books. In another departure from the Great Books series, the set included black-and-white drawings of most of the authors by Chicago portraitist Fred Steffen, who also wrote brief notes describing the illustrations. Details from a number of these drawings were featured on the volume covers. Although the editors maintained that many selections were appropriate to readers as young as seventh-grade students, the set included a fair amount of material challenging for the most experienced reader. In what may have been a response to complaints about the cramped typography of the Great Books, the Gateway volumes were single-column with larger, more readable type. Many of the same criticisms leveled at the Great Books can be made of the Gateway set. The books concentrated heavily on Western European and American literature and included few selections by women or minority authors. The set is now out of print but is easily available from used book websites on the Internet. * Guy de Maupassant, "Two Friends"
* Edgar Allan Poe, "The Tell-Tale Heart", "The Masque of the Red Death"
* Nikolai Gogol, "The Overcoat"
* Sherwood Anderson, "I'm a Fool"
* Stephen Crane, "The Open Boat"
* Herman Melville, "Billy Budd"
* Ivan Bunin, "The Gentleman from San Francisco"
* Nathaniel Hawthorne, "Rappaccini's Daughter"
* George Eliot, "The Lifted Veil"
* Ivan Turgenev, "First Love"
* Fyodor Dostoevsky, "White Nights"
* John Galsworthy, "The Apple-Tree"
* Gustave Flaubert, "The Legend of St. Julian the Hospitaller"
* F. Scott Fitzgerald, "The Diamond as Big as the Ritz"
* Honore de Balzac, "A Passion in the Desert"
* Anton Chekhov, "The Darling"
* Isaac Singer, "The Spinoza of Market Street"
* Alexander Pushkin, "The Queen of Spades"
* D. H. Lawrence, "The Rocking-Horse Winner"
* Henry James, "The Pupil"
* Thomas Mann, "Mario and the Magician"
* Leo Tolstoy, "The Death of Ivan Ilyitch", "The Three Hermits", "What Men Live By"
* Virginia Woolf, "How Should One Read a Book?" * Matthew Arnold, "The Study of Poetry", "Sweetness and Light"
* Charles Augustin Sainte-Beuve, "What Is a Classic? ", "Montaigne"
* Francis Bacon, "Of Beauty", "Of Discourse", "Of Studies"
* David Hume, "Of the Standard of Taste"
* Arthur Schopenhauer, "On Style", "On Some Forms of Literature", "On the Comparative Place of Interest and Beauty in Works of Art"
* Friedrich Schiller, "On Simple and Sentimental Poetry"
* Percy Bysshe Shelley, "A Defence of Poetry"
* William Hazlitt, "My First Acquaintance with Poets", "On Swift", "Of Persons One Would Wish to Have Seen"
* Charles Lamb, "My First Play", "Dream Children, a Reverie", "Sanity of True Genius"
* Thomas de Quincey, Literature of Knowledge and Literature of Power", "On the Knocking at the Gate in Macbeth"
* T. S. Eliot, "Dante", "Tradition and the Individual Talent"
* Ralph Waldo Emerson, "Thoreau"
* Nathaniel Hawthorne, "Sketch of Abraham Lincoln"
* Walt Whitman, "Death of Abraham Lincoln"
* Virginia Woolf, "The Art of Biography"
* Haniel Long, "The Power within Us"
* Pliny the Younger, "The Eruption of Vesuvius"
* Tacitus, "The Life of Gnaeus Julius Agricola"
* Lucian, "The Way to Write History"
* Thomas Paine, "A Call to Patriots - December 23, 1776"
* George Washington, "Circular Letter to the Governors of All the States on Disbanding the Army", "The Farewell Address"
* Thomas Jefferson, "The Virginia Constitution" from Notes on Virginia, "First Inaugural Address", "Biographical Sketches"
* Benjamin Franklin, "A Proposal for Promoting Useful Knowledge among the British Plantations in America", "Proposals Relating to the Education of Youth in Pennsylvania"
* Henry David Thoreau,"Civil Disobedience", "A Plea for Captain John Brown"
* Abraham Lincoln, "Address at Cooper Institute", "First Inaugural Address", "Letter to Horace Greeley", "Meditation on the Divine Will", "The Gettysburg Address", "Second Inaugural Address", "Last Public Address"
* Francis Bacon, "Of Youth and Age", "Of Parents and Children", "Of Marriage and Single Life", "Of Great Place", "Of Seditions and Troubles", "Of Custom and Education", "Of Followers and Friends", "Of Usury", "Of Riches"
* Jonathan Swift, "Resolutions when I Come to Be Old", "An Essay on Modern Education", "A Meditation upon a Broomstick", "A Modest Proposal for Preventing the Children of Ireland from Being a Burden to Their Parents or Country"
* David Hume, "Of Refinement in the Arts", "Of Money", "Of the Balance of Trade", "Of Taxes", "Of the Study of History"
* William James, "On a Certain Blindness in Human Beings", "The Energies of Men", "Great Men and Their Environment"
* Arthur Schopenhauer, "On Education"
* Michael Faraday, "Observations on Mental Education"
* Edmund Burke, "Letter to the Sheriffs of Bristol"
* John Calhoun, "The Concurrent Majority"
* Thomas Babington Macaulay, "Machiavelli"
* Jean Jacques Rousseau, "A Lasting Peace through the Federation of Europe"
* Immanuel Kant, "Perpetual Peace"
* Francis Bacon, "The Sphinx"
* Jean Henri Fabre, "A Laboratory of the Open Fields", "The Sacred Beetle"
* Loren Eiseley, "On Time"
* Thomas Henry Huxley, "On the Relations of Man to the Lower Animals", "On a Piece of Chalk"
* Claude Bernard, "Experimental Considerations Common to Living Things and Inorganic Bodies"
* Ivan Pavlov, "Scientific Study of the So-called Psychical Processes in the Higher Animals"
* Friedrich Wohler, "On the Artificial Production of Urea"
* Galileo, "The Starry Messenger"
* Hermann von Helmholtz, "On the Conservation of Force"
* Kees Boeke, "Cosmic View"
* Andrew Russell Forsyth, "Mathematics, in Life and Thought"
* Alfred North Whitehead, "On Mathematical Method", "On the Nature of a Calculus"
* Bertrand Russell, "The Study of Mathematics", "Mathematics and the Metaphysicians", "Definition of Number"
* Edward Kasner and James R. Newman, "New Names for Old", "Beyond the Googol"
* Tobias Dantzig, "Fingerprints", "The Empty Column"
* Leonhard Euler, "The Seven Bridges of Konigsberg"
* Norman Robert Campbell, "Measurement", "Numerical Laws and the Use of Mathematics in Science"
* Henri Poincare, "Space", "Mathematical Creation", "Chance"
* Charles Sanders Peirce, "The Red and the Black"
* John Erskine, "The Moral Obligation to Be Intelligent"
* William Clifford, "The Ethics of Belief"
* William James, "The Will to Believe", "The Sentiment of Rationality"
* Epicurus, "Letter to Herodotus", "Letter to Menoeceus"
* Cicero, "On Friendship", "On Old Age"
* Francis Bacon, "Of Truth", "Of Death", "Of Adversity", "Of Love", "Of Friendship", "Of Anger"
* George Santayana, "Lucretius", "Goethe's Faust"
* Voltaire, "The Philosophy of Common Sense"
* John Stuart Mill, "Nature"
* Ralph Waldo Emerson, "Nature", "Self-Reliance", "Montaigne; or, the Skeptic"
* William Hazlitt, "On the Feeling of Immortality in Youth"
Great. This is really interesting . I think I'll have pleasur to read it. I had a look on thei pdf but I can't see if it's only the first volum !? If so are the other volums comming in ? A new working link, please? Thanks a lot in advance. Thanks a lot for this smart selection!! !